When Roy Eichelberger arrived at the scene to check on his sister, everything was already gone. Both her house and her next-door daycare center were flattened. Only the house’s foundation remained, surrounded by strewn children’s toys, diapers, and scrap metal tangled with splintered planks of wood embedded with nails dangerously jutting out. Help Storm Victims in the U.S.The EF-4 tornado that swept through Louisville, Miss., only landed for a matter of seconds, but the damage was devastating. Everything was gone—including Roy’s sister. Children’s clothes and diapers were strewn around Ruth’s property, mixed in with wood and nails that dangerously jutted out. The community loved Ruth Eichelberger Bennett. She ran a popular local daycare with a long waiting list. Damon said that it wasn’t unusual for children to cry when their parents came to pick them up because they didn’t want to leave Ruth just yet. Her love for the children of Louisville was more than evident in her life. It was even apparent in her death. Ruth’s body was found with her arms wrapped around a 4-year-old girl who was covered in a blanket. The child was her only charge who hadn’t been picked up by her parents before the storm. Ruth gave her life so the little girl could live. 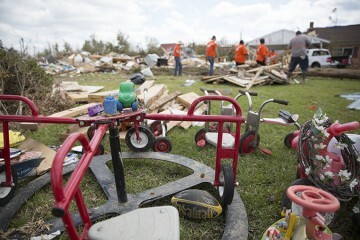 When Samaritan’s Purse volunteers arrived on the scene to help clear the debris, the lot looked like a junkyard. Ruth’s relatives, including her brother Roy and her son Damon, insisted on working alongside the volunteers. 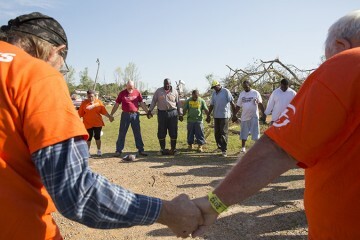 Volunteers gathered to pray with Roy and Damon after cleaning up the damage the storm left behind. Roy said everyone in the family was appreciative of the volunteers who helped. Without assistance, it would have taken the family much longer to deal with the devastation—something that overwhelmed them as they were simultaneously planning a “home-going” for Ruth. 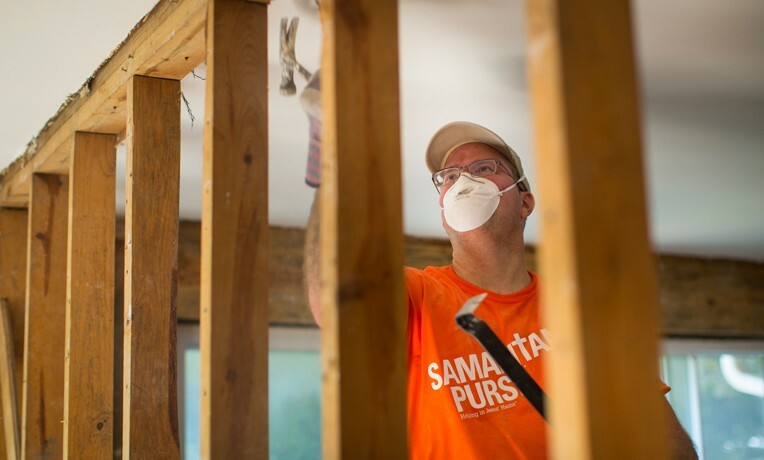 The prayers and comfort they received from volunteers also made an impact on the family emotionally. Please pray for Ruth’s family and community as they grieve her loss, and continue to pray for the families of tornado victims as they deal with the aftermath of the storms across the country. Please also pray for our staff and volunteers as we strive to serve these hurting people in Jesus’ Name.